On February 3, our city will host the single-biggest media-and-sports event of all, Super Bowl LIII. That’s the 53rd, for all of us non-ancient Romans. And it will be the third Super Bowl to take place in Atlanta, having hosted XXVIII in 1994 and XXXIV in 2000. With these Roman numerals flying around, we’re reminded of the grandeur that the Big Game has grown into. Being chosen to host it three times is a favorable comment on the persistent value of Atlanta real estate. When early AFL team owner Lamar Hunt christened the game “Super Bowl” in 1966, it could reasonably have provoked some skepticism because of its comparatively humble beginnings. When the Roman numerals were added, soon after, it looked like an outsized fuss over an admittedly big sporting event. The explanation given today officially is that the Roman numerals helped clarify that each Super Bowl is the culmination of a season that began the year before. Yet, the fact that Super Bowl 50 reverted to a recognizable number, to avoid the underwhelming graphic presence of the single letter L, testifies to an ulterior motive. There’s little doubt that the games are enumerated the way they are to contribute to the appearance of importance. And while that might have been pretension in the early years, the Super Bowl certainly lives up to the image today by any measure – including financial. The demands of hosting a Super Bowl are staggering. But Atlanta fulfills them with experience, organization, and – this time – with art. Ten local and regional artists were commissioned to paint 30 enormous murals on nearby sites that include Downtown, Vine City, English Avenue, Sweet Auburn, and Castleberry Hill. The purpose is to celebrate the artistic energy of Atlanta and make sure the visiting world is aware of it. Of course, that artistic energy is evident in the stadium itself, too. Mercedes-Benz Stadium is widely recognized in architectural circles for its vision and capabilities. The Stadium’s oculus, or eye-to-the-sky (the device that opens and closes its dome), is an exceedingly high-tech innovation inspired by the ancient Pantheon in Rome, yet another connection with grandeur fulfilled. The skill sets required to make such a structure a reality are part of what makes Atlanta new construction such a popular choice among investors and developers. The sheer organizational skill and capacity the Super Bowl requires is a high bar to reach for any city. For Atlanta to be entrusted with it three times is a statement of that strength. 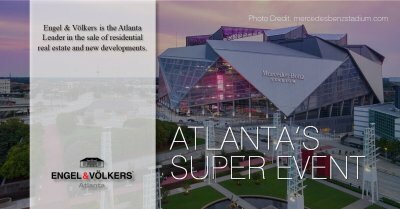 As the Atlanta leader in real estate and new developments, we’d be glad to talk with you about Atlanta’s remarkable ability to envision, organize and execute, and the impact this ability has on the value of Atlanta condos, among many other residential and investment opportunities. Just call us at 404-845-7724 or find out more at evatlanta.com.